Hello and Happy Poetry Friday! Be sure to visit Sylvia at Poetry for Children for Roundup. I look forward to reading everyone's posts today! 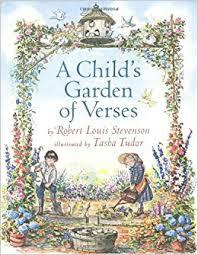 Last month when I was in Memphis, we shopped at a used/new bookshop called Burke's Books, and I brought home a beautifully illustrated version of A CHILD'S GARDEN OF VERSES by Robert Louis Stevenson. This is not a book I recall from my childhood, but I do know a few of Stevenson's poems, like "My Shadow" and "The Swing." O! don't you wish that you were me?" But it's not so nice as mine:"
So NOT the message we want to send any child! It reminds me of the recent name change of the Laura Ingalls Wilder Award. I grew up on the Little House books and love them to this day. BUT. These books require some discussion with today's reader -- a discussion that might include ways these attitudes are wrong and how this kind of language is inappropriate and also how the fact that we are aware now of its wrongness and inappropriateness shows how far we've come as a society. Also, part of the discussion might be in how to "take what you like and leave the rest." How can we still honor/support/love these authors and/or their works in spite of these things? For I will always love the Little House books. I will still recommend them to others. Just as I will recommend Robert Louis Stevenson's "My Shadow." But now I feel I need to say more -- and I will, as I am doing here today. No one need wish s/he were anyone but exactly him or herself. People live DIFFERENT lives, not better or worse. All humans are equal and should be treated as the valuable, precious gifts that they are. It helps me to look at these people and their words as historical artifacts. We can learn something from them. We can learn about ourselves. And now, on a happier note, the aforementioned lovely "Summer Sun:"
Into the laddered hayloft smiles. "A Child's Garden of Verses" was my favorite and first poetry book that I can remember. I remember my mother explaining what a counterpane was as she read "The Land of Counterpane". So many good poems in there! I do not remember "Foreign Children" at all. I think it is important to keep these reminders of how we have grown. It is dangerous to eliminate our mistakes from history. Laura's books were a memoir, and as such she can't take back what was said or done. But we CAN visit the issues with our children to make sure history doesn't repeat itself simply because we didn't know the wrong happened before. BTW, don't you just love "The Swing"? I think you wrote my comment for me, Donna. (Except for the counterpane.) But I too don't remember foreign children - though for sure I do remember 'The Swing'! Soaring poem. And I agree with what you said about Laura's works. They are a snapshot of that time - and it's a sad truth that they didn't know any different then. But now we do. For which we can all be thankful! Stevenson did reflect a time from his perspective, and most of the time he gives us a look not thought of before, like "Yet he will find a chink or two/To slip his golden fingers through." about the sun. I do remember talking about some of the Wilder books with my children, especially the scene about wanting that "Indian baby" & my children asked about it, how it could "be"? It made me aware to be sure I explained often about past times and ones not always good for everyone. Thanks for bringing up the challenge of being aware of changing views, Irene. Hear! hear! I agree. I am not resistant to change...including change that comes from greater understanding. Oh, my gosh....it's time to get back outside into that gorgeous sunshine that can "please the child, to paint the rose,The gardener of the World, he goes." I have a number of poetry anthologies published in the early and mid 20th century and it's always surprising, and makes me wince, when I come across a racist ditty. How can people have been/be so unfeeling? The world has a ways to go, but it is a bit heartening to realize how far we've come. If for no other reason, we mustn't bury the past. Thanks for tackling it head on, Irene. Thanks for sharing your thoughts so openly about the good/bad that works like these (by Stevenson or Wilder) bring to the table. I agree completely! Yes, we can keep the good while we learn to identify and call out the bad (racism, microaggressions, etc). Irene - thanks for your post. Stevenson was a favourite poet in my childhood and I still love much of his work, but agree that 'Foreign Children' is racist and not something I would share with children today. Interesting that, like others who've posted here, it's not a poem I remember, even though I owned the collection (still do, in fact). Could it be that the adults in our lives glossed past this poem because of a discomfort, or perhaps that even as children reading it we were discomfited by such a problematic message? I don't think we can rewrite history, but I do think, when we choose to share works from times such as this, that we must do so through a critical lens. Thank you for this post, Irene. It's important that we not throw out the baby with the bathwater, or however that saying goes. At least I usually think it is. I go back and forth on this. I can't separate out a work from its creator, so that sometimes calls for me to make some judgment about whether someone was just ignorant/a product of their time versus being aggressively bad/evil. There's no easy answer, and sometimes I just want to cry when I discover some glorious poem or work of art was created by a hateful person. It just doesn't seem fair. But all we can do about it today is talk about the work and its context in a thoughtful, compassionate way. I remembered loving A Child's Garden of Verses as a child (I still have that old copy). My favorite was The Swing, but I don't remember the other poem at all. I will have to go back. I can remember being shocked at the racism when I read the Little House books with my daughter. We had some hopefully thoughtful discussions at that time. We have come a long way, and I think thoughtful discussions that put works in context move us further along than just throwing out everything, but it's not an easy path to navigate. That was one of my very favorite books growing up. Reading it as an American child living in Kenya, I interpreted the "Foreign Children" poem as an expression of a little British child who was ignorant about the rest of the world. When he said that the other children's lives weren't as good as his, I just thought he was wrong! But I can completely see what you are saying now, reading it with grownup eyes. Thanks for this, Irene. I loved reading the Little House books as a child and with my daughter (yikes--almost 20 years ago!) But I'm also thankful that our awareness has changed, and agree wholeheartedly with the importance of discussing and calling out assumptions that are racist and exclusionary. What's not to love about this poem? I had no idea of the racist poems in that collection. I, too, grew up with Little House, but when I've tried to read them with kids today, they fall flat. I think I'm leaning into this change that comes with awareness. We can be better.